It’s hard to argue that March and April aren’t the greatest sporting event months of the year. You’ve got March Madness, Opening Day in MLB, the beginning of both the NBA and NHL playoffs, and you even have the NFL draft where hopeful fans can dream their team drafted the next Aaron Rodgers or Khalil Mack. But this sporting event stole the show over the weekend and it wasn’t even close. The Masters at Augusta National in Georgia is by far the most coveted of all the golfing Majors Championships. Even calling it monumental would be an understatement by most golfers’ standards. It can catapult unknown golfers into megastars like it did with Bubba Watson and Jordan Spieth. Even last year’s winner, Jordan Reid, was painted as a villain after it was revealed that his fellow golfing colleagues voted him as the most hated in the sport. It was even framed with a hypothetical question about whether you’d help him if he got into a fight. However, this Masters Major was one for the ages. On the first day, all of golf’s biggest stars were in contention; Rory Mcllroy, Jordan Spieth, Bubba Watson, Phil Mickelson and of course Tiger Woods. Woods was tied for second at the end of the second day. On the end of the third day, again, tied for second, just two shots off of the lead. The ratings were through the roof. CBS announced the huge bump on Twitter. But there was a twist on Sunday. The weather was looking rough in the afternoon, which forced the golfers into early tee-off times. The final grouping – they made a decision to have groups of three instead of usual pairings – of Woods, Finau and Molinari’s tee-off time was at 9:30 am eastern standard time. 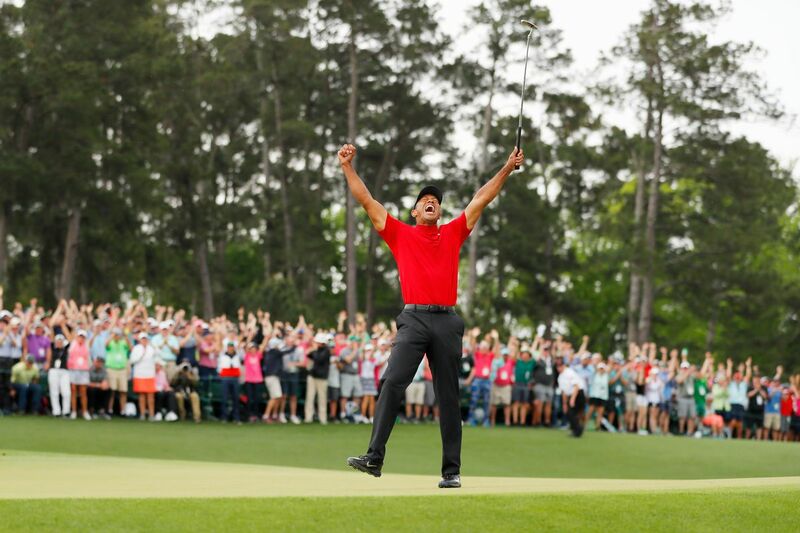 Nobody thought it would happen again, but Tiger Woods won his fifth Master’s Championship and was cloaked in the ugly green jacket once again. It had been twenty two years since he first won the Master’s where the 21-year-old cherished the moment by hugging his father. 22-years later, it was a balding Tiger Woods who hugged his young son and daughter to complete the circle. It was a heartfelt moment from a guy who has faced health issues that has prevented him from being at the top of his game. As of the time of publishing the article, it’s unclear whether Sunday’s CBS Master’s had higher ratings than Saturday’s but you’d have to be a fool to think otherwise. The only thing that might work into unfavorable ratings is the fact that the early tee-off time could’ve stifled West Coast viewership, but this was the kind of event that you’d wake up early to watch. Tiger Woods has been the biggest name in golf since he was basically a teenager. Many of his colleagues attribute golf’s popularity to Tiger Woods, single-handedly. It makes you wonder who dominated their individual sports more than Tom Brady, Michael Jordan, Wayne Gretzky or Derek Jeter. Tiger Woods has officially entered that pantheon of the GOAT status and this past win is the proof.